Sometimes life seems full of obstacles that can prevent us from experiencing peace in Christ. Even in the safest place life can offer, you can feel devoid of peace. No matter how hard you try, you cant seem to find a peaceful balance of living between your worry over the present and fear of the future. 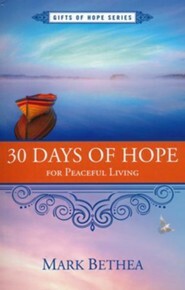 30 Days of Hope for Peaceful Living offers encouraging insight through examining what Gods Word has to say about peace. Author and pastor, Mark Bethea, shares personal reflections of Gods faithfulness through times of uncertainty and biblical understanding for how peaceful living can be accomplished, no matter what life throws at you. Mark Bethea is pastor of Argo Baptist Church and also acquisitions and digital editor for New Hope Publishers. In his pastoral ministry and service as a leader in the church, he has seen how chaos affects people and their ability to find peace. He holds a master of divinity from New Orleans Baptist Theologival Seminary and a bachelor of arts in communication from Auburn Universiity. He and his wife, Brittany, reside in Birmingham, Alabama. 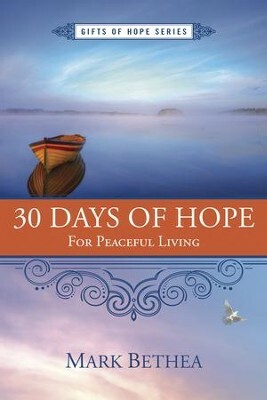 I'm the author/artist and I want to review 30 Days of Hope for Peaceful Living - eBook.